Jive’s customers include high-growth businesses and public sector institutions needing a scalable platform that is more flexible and cost-effective than their existing legacy systems. Jive’s cloud architecture offers an integrated, seamless experience that provides richer context and creates more efficient connections between co-workers and clients. Jive’s cloud delivery model ensures that each organization always has the latest technology, features, and applications—making Jive the last phone system you’ll ever need. Get all the goods here. TrustRadius, the most trusted site for B2B software reviews, recently named Jive a 2019 Top-Rated VoIP Provider! And not only a Top-Rated VoIP Provider, but the highest rated! Jive was recognized by Business.com as the best business phone system for features and tools. Read the full review for more information. This is Part Two of our interview with Mike Chase, Director of Channel Management at Jive Communications, as he discusses many of the market trends driving the communications market and the way Jive and other market players are evolving their models and capabilities. In Part Two, Mike speaks to some of the many emerging technologies that are creating new opportunities for providers and customers alike. If you missed Part One, you may read it here. Q: The early days of Jive (founded in 2006) were defined by bootstrapping. What lessons did you learn from this period of self-funding and how did this help to shape Jive’s culture moving forward? A: Most of Jive's history was built on bootstrapping. It’s helped mold our culture over the years and has taught us a lot about risk-taking and the importance of being customer-centric. SourceForge recently caught up with Jim Somers, the Vice President of Marketing / Unified Communications & Collaboration (UCC) for Jive by LogMeIn, to discuss cloud multi-tenancy and explains how a true multi-tenant cloud architecture optimizes business performance while mitigating risks and cutting costs. Somers also offers insights on the future of cloud communication and shares how Jive Cloud enables businesses to scale more rapidly and evenly. Here at GetVoIP, we are always on the lookout for the absolute best value and platform for organizations. Our goal is to provide businesses with the information they need to make an informed decision — especially when that decision comes to something as critical for success as a communications platform. Jive Communications has always been in our focus, and considered a strong pick among the competitors in the market. Unified communications (UC) creates a new paradigm for business communications and collaboration as it enables globally dispersed teams to connect seamlessly and efficiently, from anywhere and at any time. VoipReview recently spoke with Jim Somers, the Vice President of Marketing / Unified Communications & Collaboration (UCC) at Jive Communications, to discuss their latest partnership with LogMeIn. Jive is a small business VoIP provider that focuses on providing a plug-and-play setup and an easy-to-use user interface. With this hosted VoIP system, you’ll be up and running with little downtime. More than a third of the work force in the United States is between the ages of 18 and 34 year old, which means that millennials have surpassed Generation X to represent the largest share of working Americans. It’s critical, then, that companies know how to recruit and retain millennials — and studies show that it’s not all about beer taps in their communal kitchens, craft coffee or bagel fridays. Seven in 10 U.S. workers admitting to using jargon at the office, according to a survey of 2,000 American workers conducted by OnePoll, in conjunction with Jive Communications, which is owned by LogMeIn. Not surprisingly, six in 10 workers don’t understand some of these annoying phrases, and 27 percent says they stop listening when someone uses them. It’s been quite a year for Jive Communications, the sponsor the Channel Partners Studios in the Channel Partners expo hall. The highlight, of course, is its recent acquisition by LogMeIn, which the companies say brings together an IT powerhouse with a UC and VoIP leader. Do you tell your employees to “give it 110 percent?” Please … don’t. That phrase, according to a survey by OnePoll of 2,000 American workers on behalf of communications technology provider Jive Communications, topped a list of 40 of the most cringe-worthy phrases said in the workplace. Millennials are the most patient generation of all, according to surprising new research by Jive Communications. The study into customer service expectations from Jive Communications found millennials are also the most likely to forgive and forget. Yet more consolidation in the enterprise collaboration software market. Today LogMeIn, the company that offers conferencing services like GoToMeeting and join.me as well as authentication and other online services to businesses and others, announced that it would acquire Jive Communications for $342 million in cash plus up to $15 million based on reaching specific milestones in the next two years. LogMeIn, Inc. (Nasdaq:LOGM) announced today that TMC, a global, integrated media company, has named the Jive Unified Communications Platform as a recipient of the 2018 Unified Communications Excellence Award presented by TMC’s INTERNET TELEPHONY magazine. This is the second award TMC has given Jive in recent months as the product was also recognized as a 2018 Internet Telephony Hosted VoIP Excellence Award winner. RevenueWell Systems, LLC, a leading provider of patient engagement solutions for the modern dental practice, announced today the availability of https://www.revenuewell.com/rw-phone-more-infoin partnership with LogMeIn's Jive Communications. RevenueWell Phone incorporates Jive Voice, an award-winning cloud-based unified communications service. When coupled with RevenueWell's current capabilities, RevenueWell Phone will provide the dental practice staff with new and improved ways to engage with their patients. Solutionreach, the leader in patient relationship management (PRM) solutions, announced today it has partnered with VoIP business phone system provider Jive by LogMeIn. This new relationship will provide options for Solutionreach customers so they can utilize faster, easier communication, and take advantage of new products and services now and into the future. LogMeIn, Inc. today announced that Jive Communications’ Jive Voice product has been named an INTERNET TELEPHONY Hosted VoIP Excellence Award Winner from TMC. Jive Communications, a Communications and Collaboration brand at LogMeIn, honored among winners in 2018 People’s Choice Steve Awards for Favorite New Products! Click to see the full list of winners. LogMeIn, Inc. (Nasdaq:LOGM) today announced that it has completed its acquisition of Jive Communications, a leading provider of cloud-based phone systems and Unified Communications (UC) services and one of the fastest growing players in the Unified Communications-as-a-Service (UCaaS) space. Jive Communications Inc, a cloud-based phone system and Unified Communications company, today announced their newest integration with Zoho CRM. The integration makes Jive’s industry-leading telecommunications features available from within Zoho’s powerful CRM, enabling businesses to better communicate with customers. Jive SD-WAN provides easier network management and cost savings compared to traditional WAN. BOSTON, Feb. 08, 2018 (GLOBE NEWSWIRE) — LogMeIn, Inc. (Nasdaq:LOGM) today announced that it has entered into a definitive agreement to acquire Jive Communications, a leading provider of cloud-based phone systems and Unified Communications services and one of the fastest growing players in the Unified Communications-as-a-Service (UCaaS) space. 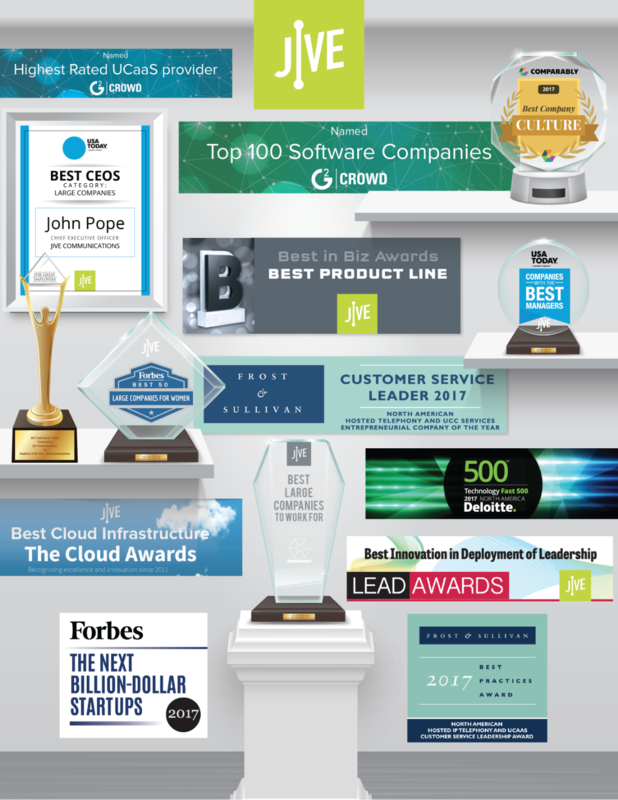 Jive Communications, a cloud-based phone system and Unified Communications company, has been included on G2 Crowd’s Best Software Companies 2018 list. The list recognizes the top 100 business software companies in the world, based on G2 Crowd’s verified user reviews in 2017. Jive scores top ranking alongside other industry leaders in USA Today’s and Business Insider’s lists. Jive Communications was awarded for Best Product Line of the Year for Enterprise and SMB in the Best in Biz Awards. The Best in Biz Awards are the only independent business awards program judged each year by prominent editors and reporters from top-tier publications in North America. Jive Communications announced today that TMC, a global, integrated media company, has named Jive Voice as a recipient of the 2017 Unified Communications Excellence Award presented by TMC’s Internet Telephony magazine. Cloud communication providers reposition and realign strategies to ensure long-term success, finds Frost & Sullivan.